The inland promontory of Cardean, Angus (NO 288460) lies at the confluence of the Isla and the Dean Water. It has long been recognised as the site of a Roman installation (NMRS no NO24NE 12), and has received wide attention in the archaeological world since O.G.S. Crawford’s (1939, 287ff) rediscovery of the site from the air. From 1966-1975 it was the site of extensive archaeological excavations by Prof. A.S.Robertson (Glasgow) and Prof. J.J. Robertson (Dundee), for much of the time as the site of the Scottish Field School of Archaeology. After Prof. A.S.Robertson’s death in October 1997 the writer was given the task of preparing the site records for publication. The work is supported by Historic Scotland, which also paid for the survey here presented, and whose help is gratefully acknowledged. 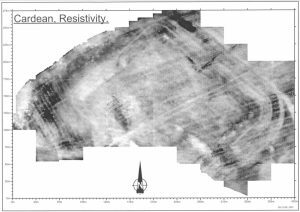 During the early stages of compiling the site report, marked discrepancies became apparent between the reported trench locations and the Air and excavation photographs. These were further highlighted by the problems the RCAHMS have encountered in rectifying the substantial number of Air photographs of the site, especially with regard to the fort’s northern defences. It was hoped that a large scale resistivity survey of the promontory would help to solve these problems as well as shedding additional light on the internal structure of the fort and a number of structures tentatively reported in Antiquarian reports outside the it, notably the possibility of an external bath-block and the location and extent of Iron Age occupation. The latter is attested through the existence of a souterrain close by, as well as by a bun quern recovered during fieldwalking and by the substantial quantity of Iron Age pottery found during the excavations. The survey was conducted by 2 teams using Geoscan RM-4 resistivity meters and the results plotted using the Golden Software, Surfer package. One team worked on the interior of the fort and the southern defences, while the second team explored the northern defences and the western promontory, including the western annex. In total 7.3 ha were surveyed at 1 m resolution. A fieldwalking program was purposefully designed to cover a larger area than the resistivity survey, to explore the spread of artefacts beyond the defences of the fort, as well as highlighting any possible areas of industrial activity, by looking for concentrations of charcoal, burnt material and metal slag. Special attention was given to the area immediately to the East of the fort as the likely location for a civilian vicus, as well as of Iron Age activity in the vicinity of the souterrain. In co-operation with the Field Archaeology Group of the Archaeological & Historical Section of the Perthshire Society of Natural Science, under Irene Hallyburton, a grab survey was conducted at 20m and 5m intervals and the location of the finds recorded via handheld GPS. Unavoidably, the work was conducted under less than perfect field conditions, with inclement weather compounding the effect of a survey conducted in stubble. In Prof. A.S.Robertson’s notes passing reference is made to a fabrica/workshop area. This does not appear among the excavated structures but has to be assumed on the basis of high concentrations of metal and possible glass working waste among the backfill of the fort ditches. As the areas of workshops are often associated with concentrations of burning and small metal finds, it seemed reasonable that a metal-detector survey looking for concentrations of metal signatures (‘bleeps’) should be able to locate the site of any possible fabrica. Transects of the site were thus scanned and the location of the metal detector signals recorded with GPS. To verify the nature of a sample of the ‘bleeps’ this work was followed up with an exploration of the plough soil to a maximum depth of 6 in (the average depth of the plough soil in the 1970s excavations was 8-10 in), ensuring that intact archaeological deposits should not be disturbed under any circumstances. This exploration, apart from verifying the nature of the signals (and filtering out modern contamination), was purely designed to recover unstratified material which would otherwise be destroyed by ploughing. In the course of the survey a 25m mapping error on the part of the Ordnance Survey was discovered, which placed the southern edge of the field too far to the south. This had resulted in faulty surveying data both in the position of the excavation trenches and in the mapping of Air archaeological evidence. Thanks to heavy rain during the first few days of the survey the Isla and its tributaries flooded heavily providing an unexpected opportunity to conduct a limited flood plain survey. It was, therefore, decided to extend the original flight plan of one of the Roman Gask Project’s Air reconnaissance flights to document this flooding in relation to known archaeological sites in the area. The survey showed amongst other things that many prehistoric settlements, such as Barmondy downstream from Cardean, were carefully sited to be as close as possible to the water, while staying safely above flood level. 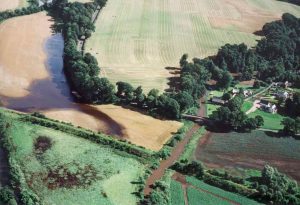 This survey is now informing attempts to reconstruct the natural environment around Meigle in the Roman/late Iron Age period by helping to define the likely course of the river bed before the regulation work of the 18th and 19th centuries. As part of this survey an old arm of the Isla was recognised that flows right at the base of the northern front of the Cardean promontory (See fig 1). This section apparently still floods so frequently that the farmer has now effectively abandoned farming this part of the field. In addition local knowledge has it that even today the Isla is seasonally navigable for flat-bottomed boats as far as Balbirnie, just south of Ruthven and upstream from Cardean. This raises the possibility that the forts of Bertha, Inchtuthil, Cargill and Cardean may originally have used the Isla and Tay as their main arteries of transport and communication, with the old arm providing a convenient landing point at Cardean. This would also help to explain the absence of any incontrovertible evidence of Roman roads in Strathmore outside the immediate Inchtuthil area. The majority of fieldwalking material recovered dates to the 18th – 20th centuries. No Roman pottery was recovered, but at the southern edges of the field to the east of the South annex a concentration of burnt brick of non-Roman fabric was identified. A survey of old maps suggests that occupation of the promontory continued until the early 18th century and it is possible that this is one of the sites in question (for another possible site see the results of the resistivity survey). 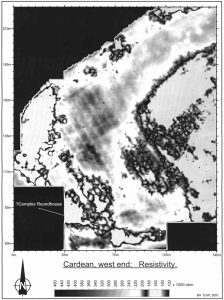 The natural magnetic disturbances of the various rocks and sands on the site made the original aim of identifying particular concentrations of metallurgical activity unworkable (and also ruled out a magnetometer survey). There were, however, areas with a high concentration of heat deformed lead on the western promontory. The rest of the fort tended to be saturated with 18th – 20th century metallic agricultural waste (e.g. tractor parts, sheet metal of unknown nature, a padlock etc). The only exceptions were two coins, which have been provisionally identified by Dr David Shotter as ‘early Vespasianic’ and ‘Vespasianic’. This sits well with the coins recovered from the excavations, all of which are pre-Domitianic. In all 7.3 ha were surveyed covering most of the western part of the promontory. In the east, a strip of about 20 m width, at the southern edge of the field, had to be omitted, so as not to destroy standing crop but, as this area roughly equals the area of the one excavated barrack block, the survey is unlikely to have suffered major data loss as a result. The area of the south annex could not be survey in its entirety due to lack of time. with most of its ditches showing along with those of the annexes. The south-western corner of the fort as well as an unknown area of the south and west annex interiors were, however, missing due to erosion by the Dean Water. 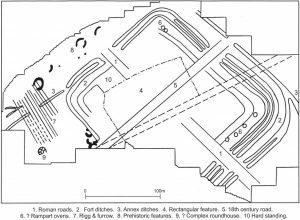 This evidence allowed a reassessment of the size of the fort to c. 3.5 ha or c. 9 acres, making it one of the largest Roman forts in Britain, on a par with the Flavian and Antonine forts in Lowland Scotland. It is interesting that the number of ditches differs markedly on each side of the fort. While only one ditch appears to separate the western annex from the fort, there are two ditches on the north side, four on the east side and six to the south, although this latter area is also protected by the ditch of the south annex. This may suggest that defensive considerations were not necessarily the only factor in placing these ditches, as the eastern side would have been much more vulnerable. The two annexes are also clearly visible. The western one is defended by a single east-west running ditch, beginning at the northwest corner of the fort and which, to judge from air photographic evidence, continues beyond the modern road towards the original point of confluence between the Dean Water and the Isla. The southern annex ditch joins the outermost fort ditch at its south-eastern corner and appears to be more substantial than that of western annex. Inside the fort some internal structures, mostly roads, are detectable, especially along the northern defences and in the south west corner, but the centre of the fort appears to be disrupted by a rectangular area on a different alignment from the Roman fort. It in turn appears to be disturbed by the track of a known 18th century road. Apart from this relative sequence, little can be said about the rectangular feature at this time, but it may be another candidate for the site of the attested medieval and early modern settlement on the promontory. The annexes and the area to the north of the fort did not show any indications of the missing bath house, but provided instead a lot of evidence for prehistoric and perhaps early historic activity. The majority of features are disturbances consistent with what would be expected of souterrains, pits and roundhouses. This cluster also occasionally shows from the air, as a number of pits as well as a forked running feature. They appear to cluster along the northern edge of the promontory and it is tempting to associate them with a souterrain village. Similar structures are already known in the area, for example, the substantial village site at Barmondy and there is a similar cluster of features on the south bank of the Dean Water opposite the promontory. This northern cluster is by no means the only trace of prehistoric features on the site although it is the largest. A smaller concentration appears to have been truncated by the western fort ditch, whilst close to the southern limit of the survey, a daisy shaped cluster of very small circular features (See fig 4) may possibly be the remains of a large round house of more complex structure. It seems, therefore, that the promontory held quite an attraction for the indigenous population. Pre-Roman occupation of the site is, as stated, clearly attested by the presence of a bun quern as well as by Iron Age pottery found under the Roman rampart during the excavations, but the chronological status of the geophysical clusters is not so easily determined and some, at least, may be post-Roman. There are accounts for good survival of the fort until the late 19th century, which suggest that the site was not completely destroyed on its abandonment by the Romans and it is quite conceivable that the Iron Age population continued to live in the space between the northern defences and the Isla or that they returned to this ready-made promontory fort after the Romans left. The latest feature covered by the survey was an area of rigg and furrow on the western promontory, pointing to medieval exploitation of the site, which is also attested by the rent records of Coupar Angus Abbey. During the survey we were able to gain access to a number of surrounding sites as well as to old records relating to Cardean and Cardean Mill thanks to the help of James and Ian Ivory (landowner), Alistair Morrison (Farm Manager) and Douglas Wares of Cardean Mill. Most of this information will be discussed more fully in the final site report, but a number of features are worth mentioning here. Local folklore has it, that there is a tunnel from the Isla to the fort. With the help of Alistair Morrison we were able to trace this feature. At the northern edge of the promontory the 19th century road crosses some very uneven terrain and it seems that in one place it was decided to cross this with the help of a small bridge, creating, in effect, a small tunnel. The feature is now dry and there is no indication of any older structures incorporated into it. At the tip of the promontory, some 150m to the west of the tunnel, is a pronounced cutting into the hill up to the road. It appears to be cut from the level of the old river arm, is about 10m long and 6 m wide and currently has a lump of concrete sitting in it. The edge of the cut is overgrown by several c. 150 year old trees. These provide a TAQ for the cut, but no other information as to its history could be found. On the south side of the promontory a carefully cobbled road runs up towards the fort field from the old Bridge of Dean. It was until recently covered in hill-wash, but has now been carefully cleaned and restored by James Ivory. Immediately to the north of the bridge this road turns to the right to achieve a gradient manageable for a cart and has a shallow gully on the up hill side, which appears to drain into the Dean Water just above the bridge. The structure of the road is consistent with 18th century construction and so this may represent part of the original surface of the 18th century Kirriemuir road. The survey was financially supported by Historic Scotland and I would like to thank their staff members Rod McCullagh and Patrick Ashmore for discussing the practicalities with me in great detail. My thanks also go to the Scottish Farmers Union and SEERAD for discussing the problems of working in a climate of Foot & Mouth Disease and so ensuring that we would not spread the disease into an unaffected area. I would also thank the RCAHMS who supported this project with advise and mapping data and most helpfully by lending us one of their staff, Rebecca Jones, for a week. I am grateful to James Robertson for visiting us on site and clarifying numerous points on the old excavations, to the Dept of Archaeology, UCD for the loan of their resistivity meter and to David Woolliscroft of the Roman Gask Project both for the loan of the second meter and for his technical advice and help in the field and while processing the data. Thanks are also due to Bill Fuller for acting as pilot during the Air survey, to David Shotter for his identification of the coins and to John Peter and Felicity Wild for help with identifying the pottery, to Emma Duggan (AOC) for the conservation of the metal finds and for discussing the results of the X-ray, to the students (Paul Murdoch and Renate Kurzmann) and volunteers (Susannah Moore, Paul Smith, David Hodgson) who helped to conduct the survey and especially to Ruth Dundas (and her anonymous supplier of survey pegs), the volunteers of the Archaeological & Historical Section of the Perthshire Society of Natural Science under Irene Hallyburton, to Douglas Wares of Cardean Mill, who became an indispensable member of the team through his indefatigable support of the survey through local knowledge, historical data the and provision of work space. Finally, my very special thanks go to Ian and James Ivory, and to Alistair Morrison for doing everything in their power to make our time on their land as successful and enjoyable as possible. O.G.S.Crawford, 1939 “Air Reconnaissance of Roman Scotland”. Antiquity 13, 51, 287ff.